Tav or Peh? and what's with the KHAF? Here is a TAV that has a longer right foot and a shorter left foot than what it should be. As such, it may resemble a Peh Peshutah with an inverted nose. This is why our Hakhamim always impress us to make the right foot a bit shorter than the left. The above letter must be shown to a Tinok, and the right foot shortened if read like a TAV. If the child reads it like a PEH PESHUTA, then its PESSULA. As per the KHAF, it looks like a cursive BET. 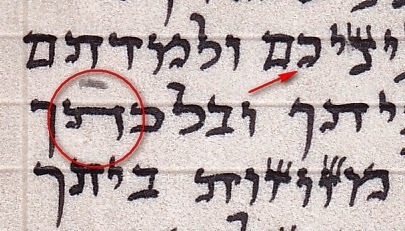 I believe that there is room to be lenient and not invalidate it right off the bat, as the letter appears more like a KHAF in the original smaller Ketav. Your input is however requested. Should it be shown to a Tinok, and fixed if read properly; or do we say that it has lost its shape and de-facto invalidate it? I'd very much appreciate your response. I would passel the tav. the caf shaylas tinok. Would the Caf pass as a Gimmel? This Khaf, because of its width, even though it shares some similitude on its bottom right with a Gimmel would never pass for it. I agree with Rabbi Traube. I'd have asked Rav Friedlander and not have made a decision on my own to ask a tinok.